Following on the Midcontinent Power Sector Collaborative Decarbonization Roadmap Analysis, the Midcontinent Transportation Electrification Collaborative (MTEC) conducted an analysis of transportation electrification in the Midcontinent region. The MTEC Transportation Electrification Roadmap finds that electric vehicles (EVs) can go a long way towards decarbonizing transportation, especially when paired with continuing carbon reductions in the power sector. EVs can also bring significant public health benefits in the form of reduced air pollution, and their flexible loads can make the electricity system more efficient, more cost effective, and cleaner. Scenario analysis in FACETS found that a wide range of future light duty vehicle (LDV) electrification is plausible, depending on future EV technology development and costs, gasoline prices, and consumer preferences. The trajectory of heavy duty vehicle (HDV) electrification is even more uncertain, as technologies are less developed and vehicle use cycles are highly heterogeneous. To assess the impacts of vehicle electrification on the power sector – including loads and load shapes, capacity investment needs, and technology mix – as well as overall emissions, we developed three electrification scenarios, using an approach similar to that used in NREL’s Electrification Futures Study. 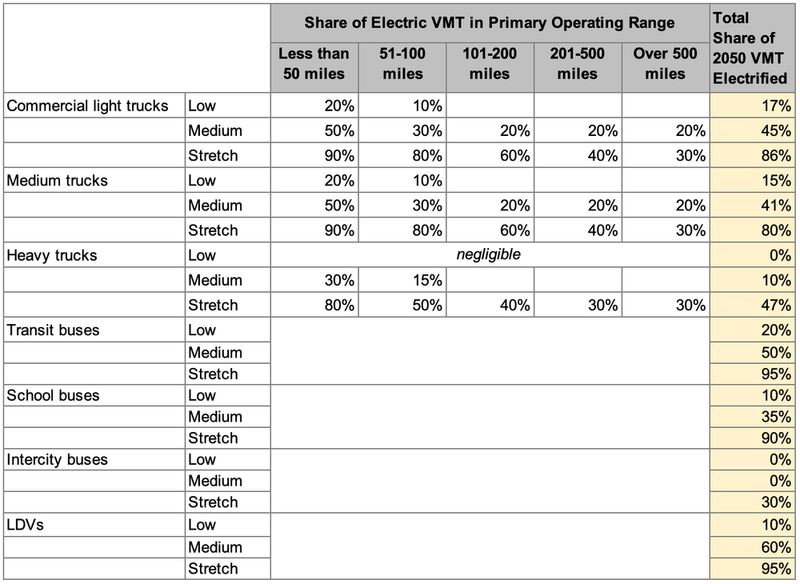 Low, Medium, and Stretch electrification level scenarios for HDVs were defined for each vehicle type according to its typical daily range, while LDVs scenarios were based on FACETS test runs and other projections. The 2050 electrification levels for each vehicle type are shown in the table at right. a model Optimized scenario in which vehicle charging is responsive to dynamic time-of-use prices. We found that vehicle electrification has the potential to dramatically increase and reshape electricity loads and to decrease both carbon dioxide (CO2) and criteria air emissions, depending on electrification level, LDV travel demand, and EV charge timing. With low electrification levels, changes to the power sector were minimal, while the combination of high electrification and high VMT demand led to load increases of up to 80 percent in the Midcontinent region. As EV penetrations increase, managed charging provides an opportunity to increase system efficiency and better incorporate renewable generation. Late Night charging helps to flatten load curve and incorporate wind generation. 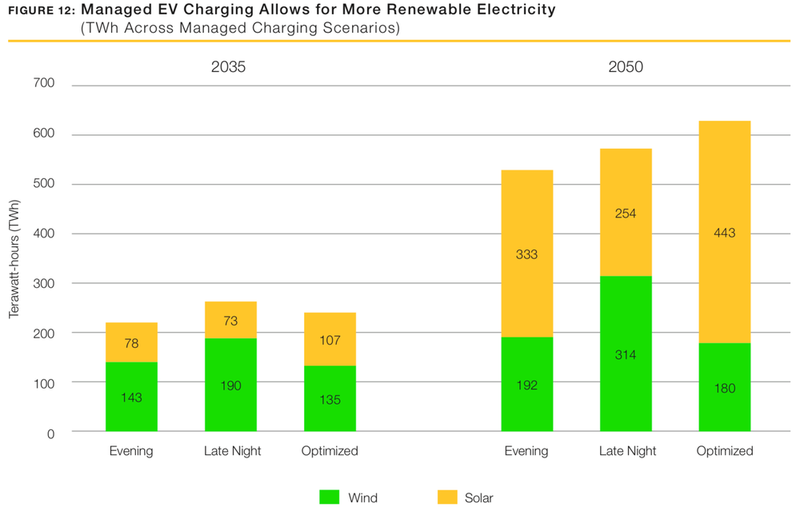 As solar deployment increases across the model horizon, price-responsive optimized charging increasingly shifts to daytime hours to utilize solar generation. Both managed charging approaches reduce system peaks, peak capacity investment requirements, renewable curtailments, and system costs. Rate designs that incentivize vehicle charging at times of high renewable energy generation are thus important measures to lower the cost of decarbonizing the electricity and transportation sectors. Electrification led to a decrease in total carbon emissions in all scenarios. Electricity in the Midcontinent is already a cleaner vehicle fuel than gasoline, and becomes more so over time across all the business-as-usual scenarios explored in the Midcontinent Electricity Roadmap analysis. The maximum total emissions reductions occur when electrification levels are highest, travel demand is low, and charging is managed to maximally incorporate renewables. Electrification also led to a steep decline in total NOx emissions across all scenarios. Here too, combining electrification with lower travel demand produces the greatest emissions benefits. Finally, we also tested scenarios in which the power and vehicles sectors jointly aim to achieve a 65 percent or 80 percent reduction from 2005 CO2 emission levels by 2050. The 80 percent reduction was only achievable with stretch levels of electrification, or medium electrification with low LDV VMT. As the carbon reduction ambition increases, price-responsive charging plays an increasingly role in reducing system costs. The full set of pathway results with all uncertainty dimensions can be explored in the results summary and load curve portals. Read the MTEC Transportation Roadmap report here. Read more about FACETS' technology representation and data sources here. The next Midcontinent Roadmap will examine electrification, efficiency, and decarbonization options in the buildings sectors. Sign up on the right sidebar to receive updates about the roadmap analyses.